The Vittala Temple in Hampi is an ancient structure, which is well known for its architecture and unmatched craftsmanship. 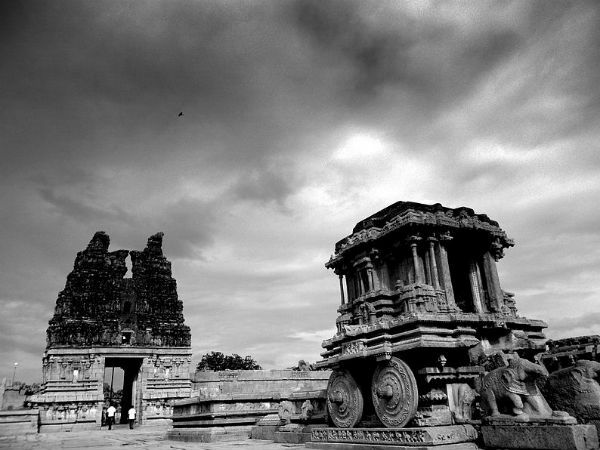 The monument is seen as one of the largest and famed structures in the group of monuments in Hampi. The temple is located in the northeastern part of Hampi near the banks of the river Tungabhadra. This temple has some beautiful stone structures - like the stone chariot which cannot be described in words and the interesting musical pillars. The temple is a major draw amongst the tourists who come from across the globe to witness the once-glorious Vijayanagara capital, which lies in ruins now. The structure was built during the rule of Devaraya II, who was one amongst the rulers of the Vijayanagara Empire. The structure was built in the 15th century. Many portions of the temple were expanded and enhanced by Krishnadevaraya, who was the most famous ruler of the Vijayanagara dynasty. The temple is also called Vijaya Vittala Temple and is dedicated to Vittala, an incarnation of Lord Vishnu. According to legends, the temple was built as an abode for Lord Vishnu in his Vittala form, but he found the temple to be a very grand one for him and hence he is said to have returned to live in his own humble home at Pandharpur. The Vittala temple is assumed to be the grandest of all the temples and monuments at Hampi. The temple showcases the immense creativity and the architectural expertise, which was possessed by the sculptors and artisans of the Vijayanagara empire. The temple is built in the Dravidian style of architecture, which speaks volumes about the grandeur of the south Indian temple architecture, with elaborate carvings that is unmatched to the other structures in the town. The main shrine originally had an enclosed Mantapa and an open Mantapa or hall was added to the structure in the year 1554 AD. The temple is spread across a large area with high compound walls and three tall gopurams. The complex also has many halls, shrines and pavilions within its circumference. Among the structures, the Devi shrine, Maha Mantapa or the main hall, Ranga Mantapa, Kalyana Mantapa, Utsava Mantapa and the much famed Stone Chariot are the notable ones. The Stone Chariot, which stands tall in the courtyard of the temple, is one of the most stunning architectural wonders and is also one of the three famous stone chariots in the country. The other two chariots are located in Konark and Mahabalipuram. The stone chariot is a shrine which was designed in the shape of a chariot. This chariot shrine is dedicated to Garuda - the carrier of Lord Vishnu, and one can find an image of Garuda housed in its sanctum. The large Ranga Mantapa is well known for its 56 musical pillars. These pillars are also known as SaReGaMa pillars, which are attributed to the musical notes emerging out of them. The musical notes can be heard when the pillars are gently tapped. One can find a set of main pillars and also several smaller ones at the mantapa. Each pillar provides support to the ceiling of the mantapa, and the main pillars are designed in the manner of musical instruments. Every main pillar is wrapped by 7 minor pillars and these minor pillars emit different musical notes. Every note coming out of these pillars vary in their sound quality and also change as per the percussion, string or wind instrument being played. By Air: The Bellary airport is the nearest airport to Hampi. The airport receives only domestic flights from major cities, with regular flights from Bengaluru. The airport is located approximately 64 km away from Hampi. By Train: The nearest major railway station is the Hospet Junction, which is around 10 km away from Hampi. The railway station is connected to all the major towns and cities across the state and to a few number of places across the country. By Road: One of the best ways to reach Hampi is by road. The place has excellent connectivity by roads. The KSRTC and KSTDC offer plenty of package tours that start from Bengaluru.